g-Oh Oh, Oh Oh Oh, Oh Oh Oh, Oh Oh…ing To Win Eurovision? In terms of working out who may win this year’s Eurovision (and hopefully making a few bob in the process) various factors can be looked at, but the three most significant ones are the Eurovision betting odds, past voting histories involving the contestants and the countries voting in the contest, and draw position. There are other factors that may be accounted for, as suggested by the All Kinds of Everything website, such as internet Eurovision polls as well as performance quality in national finals or rehearsals, but for the purpose of this post I’ll just focus on past voting history, draw position and betting odds. Past voting histories: During the televoting era, countries have shown a remarkable consistency in terms of the other countries that they vote for. This is probably most evident in the case of Greece and Cyprus’s tendency to award each other douze points in Eurovision contests, but similar trends can be observed for most other European contestants, including Ireland who showed a remarkable consistency during the “full-blown” televoting era in awarding its high Eurovision points to Lithuania, Latvia, Poland and the United Kingdom, especially from 2005 onwards. 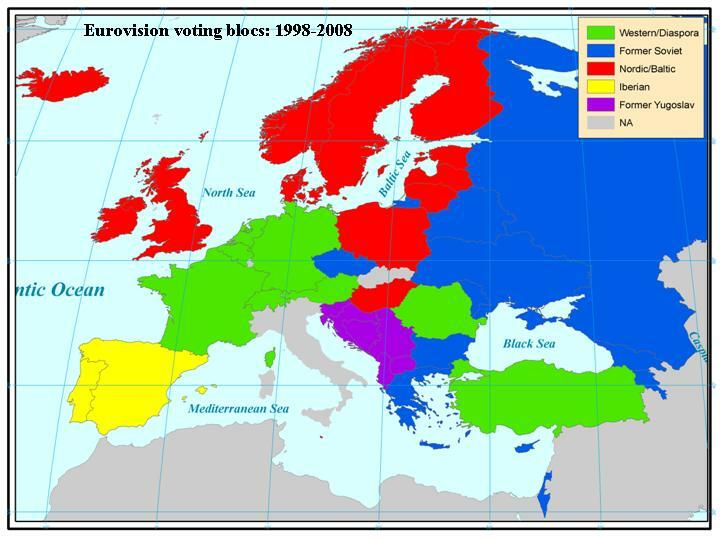 Such has been the consistency in Eurovision countries’ voting patterns during the 2000s that one can easily suggest the existence of different, geographically-based, voting blocs, which tend to award especially high numbers of points to certain countries (not necessarily always other bloc members) and from which bloc members can expect to attain their highest Eurovision points tallies. The impact of such “bloc voting” has been tempered in recent years by the reintroduction of a professional jury voting element as part of a 50-50 voting system involving televoting and jury votes. But given that televoting still accounts for half of the total votes being awarded by countries, past voting histories of countries will give a strong indicator as to the destination of their Eurovision votes in the 2011 Final, and also suggests that some countries – due to an ability to score highly within one, or more, Eurovision voting blocs – will start the contest at somewhat of an advantage to countries such as Slovenia, Switzerland, Austria, Ireland and Lithuania, who have struggled to win Eurovision points over the past decade and half. The strong concentration of “new” Eurovision countries amongst the top echelons here is readily evident (as well as the number of Eastern European countries) – indeed some of the high ranked countries only have a small number of Eurovision contests “under their belts” and it could be argued that their points tally as such reflects the fact that they have not been in sufficient contests for their high tallies to be offset by lower points tallies in less successful contests for these countries. The absence of Turkey and Armenia in the 2011 Final also has an impact in that a number of countries (notably Greece and Serbia) are picking up more ‘diaspora’ votes from Western European countries, such as Germany and France, that they might have expected to if Armenia and Turkey were in the competition. Ironically, the lowest placed country is France, currently the leading contender for ultimate 2011 success based on the bookies’ odds. That said, with jury voting and with the potential for very strong songs/performances to impact on televoters, it is possible for countries to defy their past voting histories and attain results that are very much against the run of what would have been expexted on their previous pattern of results. This has already been evident in this year’s contest – voting histories suggested low semi final rankings for countries such as Slovenia, Lithuania, Ireland, Switzerland and Austria but all these countries succeeded in making it to this year’s final. So voting history/bloc voting is only one element of the different factors that help determine a Eurovision winner, or even a strong Eurovision result/high placing. Draw position: Vote patterns for past contests suggest that a country’s draw position can (in part) determine how well they do in that contest, with certain positions in the draw (generally later) associated with a stronger likelihood of success/higher average points level as against other draw positions (generally those in the earlier part of the show). 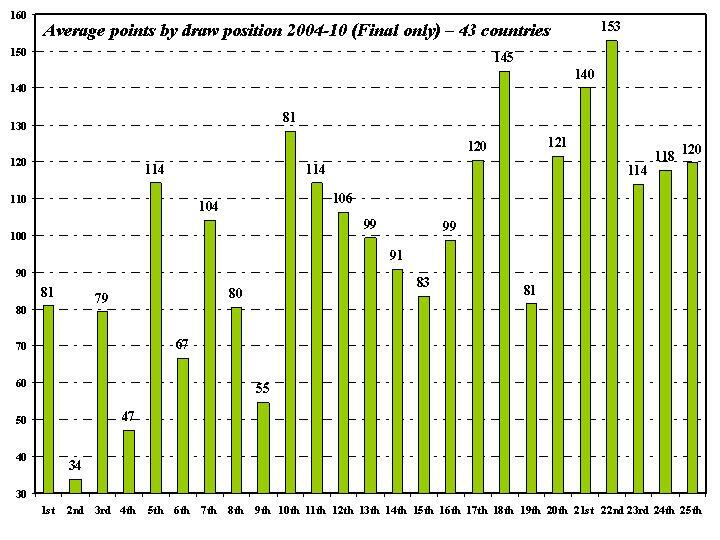 As the graph above shows (which works out the average number of points won by each draw position in Eurovision finals between 2004 and 2010), a late Eurovision draw position offers a competing country a distinct advantage. But there are subtle variants within different parts of the draw. In the earlier part of the draw entries drawn in the 5th, 7th, 8th and 1st draw positions have done significantly better than those drawn in the 2nd (the veritable draw of death), 4th, 9th and 6th positions. Similarly in the latter part of the draw, it is evident that a draw position near the end, but not at the end, is the most advantageous draw to get. It is better to be on three songs before the end than in the very last draw position – a notable difference from the trend for semi-finals in which the last draw position proved to be the most advantageous (possibly due to the generally smaller number of countries in a semi-final – the 2007 marathon semi final being a notable exception). Based solely on draw position we would be off to Madrid for the 2012 contest – the 2011 results would read as follows: 1. Spain 153, 2. Austria 145, 3. Iceland 140, 4. Russia 128, 5. Slovenia 121, 6j. Romania and Georgia 120, 8. Serbia 118, 9j. France, Hungary and Ukraine 114, 12. Italy 106, 13. Sweden 104, 14j. Switzerland and Germany 99, 16. UK 91, 17. Moldova 83, 18 j. Azerbaijan and Finland 81, 20. Estonia 80, 21. Denmark 79, 22. Ireland 67, 23. Greece 55, 24. Lithuania 47, 25. Bosnia and Herzegovina 34. It is notable that in the bulk of cases draw positions are not conveying an unsurpassable advtantage, with not much more than 40 points separating the countries ranked between 4th and 20th place, although the significant advantage of a later draw and disadvantage of an earlier draw (especially draw position No. 2) become readily apparent here. If the predicted points based on voting history and draw positions are combined the following result for the 2011 Final might be predicted: 1. Azerbaijan 167, 2. Russia 160, 3. Serbia 158, 4. The Ukraine 156, 5. Greece 144, 6. Georgia 119, 7. Romania 117, 8. Sweden 115, 9. Hungary 112, 10. Iceland 107, 11. Italy 104, 12. Spain 98, 13. Denmark 94, 14j. Moldova, Germany and Bosnia 87, 17. Estonia 82, 18. Austria 80, 19. Slovenia 78, 20. Finland 72, 21. United Kingdom 63, 22. France 61, 23. Switzerland 54, 24. Ireland 48, 25. Lithuania 45. Quids in: So is it safe to say that we are g-Oh Oh, Oh Oh Oh, Oh Oh Oh, Oh Oh…ing to Baku for the 2012 contest, with a narrow win for 2008 debutants Azerbaijan ahead of Russia, Serbia and The Ukraine? Well no, as key dimensions of what determines success for Eurovision entries have not been accounted for here – song quality and the impact of a song/the way a song is presented on the Eurovision stage. These are factors that are hard to measure but a variety of methods might be employed to determine rough estimates of these. One might involve a reliance on internet polls as a means of doing so but these may have their limitations. Probably the closest approximation can be offered by recourse to the contest betting odds; as punters will want a return on their investment it makes sense that they will be backing the best/most impactful entries in order to do so. The link between betting odds and song quality/impact is not in keeping with the principles of exact science, but at least odds do offers a means of quantifying. Furthermore, most contest observers would argue that betting odds often offer the most potent means of estimating likelihood of contest success (as noted on the All Kinds of Everything website). This has been readily evident in recent contests when the contest winner has tended to be the pre-contest favourite, or to be amongst the pre-contest favourites. This means also draws out countries, such as France, Ireland and Austria, whose likelihood of winning the competition is not evident from a study of prior voting patterns. Two different means were used of trying to translate betting odds into Eurovision points. The first method involved dividing the total number of Eurovision points available to the competing countries in proportion to current odds – in this case the Betfair odds for winning the competition for each of the 25 finalists as of midday today (13 May) which produced the following results – 1. France 195, 2. Ireland 162, 3. Azerbaijan 146, 4. United Kingdom 143, 5. Estonia 128, 6j. Denmark, Finland and Hungary 122, 9. Germany 121, 10j. Austria and Sweden 119, 12. Bosnia 109, 13. Georgia 91, 14j. Serbia and Russia 84, 16. Slovenia and Iceland 74, 18. The Ukraine 73, 19. Romania 68, 20. Italy 67, 21. Switzerland 65, 22. Greece 62, 23. Moldova 60, 24. Spain 48, 25. Lithuania 38. An alternative means of transforming betting odds into Eurovision points was to identify the rankings (as of midday on Friday 13th May 2011) of different 2011 Finalists across a range of bookie offices based on combined odds as posted at www.oddschecker.com . Points were assigned to different rankings based on the average number of points earned by countries finishing in that position in Eurovision final results over contests held over the 2004-10 period. This produced the following points estimates for the competing 2011 finalists – 1. France 304, 2. Ireland 240, 3. Azerbaijan 221, 4. United Kingdom 186, 5. Estonia 177, 6. Denmark 162, 7. Finland 143, 8. Hungary 134, 9. Germany 129, 10. Sweden 111, 11. Bosnia 99, 12. Austria 83, 13. Georgia 77, 14. Russia 68, 15. Slovenia 59, 16. The Ukraine 52, 17. Switzerland 49, 18. Serbia 43, 19. Iceland 38, 20. Romania 34, 21. Italy 29, 22. Greece 22, 23. Moldova 16, 24. Spain 10, 25. Lithuania 9. Combining the voting bloc/history patterns with the impact of draw position and the betting odd weightings (and giving these a 50% weighting), the following result would be predicted for Saturday night’s final – 1. Azerbaijan 176, 2. France 155, 3. Ireland 124, 4. Hungary 120, 5. Russia 119, 6j. Denmark and Estonia 118, 8. Sweden 115, 9. United Kingdom 114, 10. Serbia 111, 11. Ukraine 110, 12. Germany 106, 13j. Finland and Georgia 102, 15. Bosnia 96, 16. Greece 94, 17. Austria 91, 18. Romania 85, 19. Iceland 82, 20. Slovenia 73, 21. Italy 67, 22. Spain 64, 23. Moldova 63, 24. Switzerland 56, 25. Lithuania 34. Scoring strongly in terms of betting odds and ranked the strongest country in terms of vote pattern history, with a relatively good draw position, Azerbaijan is predicted to emerge as the ultimate victors in a battle between Baku and Bastille and earn that state’s first ever victory at Eurovision. But ultimately, while this analysis is suggesting the title is g-Oh Oh, Oh Oh Oh, Oh Oh Oh, Oh Oh…ing to Azerbaijan, model predictions are in themselves limited when it comes to a contest such as Eurovision that has its own certain degree of unpredictability associated with it. Ultimately the destination of Eurovision 2011 will be determined on stage in Dusseldorf over tonight’s jury final and tomorrow night’s show. This entry was posted on May 13, 2011 at 2:33 pm and is filed under Eurovision, Voting analysis. You can follow any responses to this entry through the RSS 2.0 feed. You can leave a response, or trackback from your own site.